Utrikespolitiska institutet deltar i projektet Horizon 2020, som fokuserar på differentierad integration i Europeiska unionen. Institutets forskare har gett ut böcker om EU:s östra grannskap, medierna i den postfaktiska tiden samt geoekonomi och maktpolitik på 2000-talet. As a member of a research consortium of 15 distinguished research institutes and universities, FIIA has secured funding from the EU’s Horizon 2020 framework programme for a large scale research project examining differentiated integration in the EU. The project is coordinated by Istituto Affari Internazionali (IAI) in Rome, and it will run from 2019 to 2021. The key assumption of this project is that the evolution of the EU’s politics and policies has demonstrated that differentiation can no longer be treated as an anomaly in the integration process. This poses a set of questions to academic and policy-makers alike: whether, how much and what form of differentiation is not only compatible with but also conducive to a more effective, cohesive and democratic EU. FIIA is taking the lead on Work Package 5, which will focus on differentiated integration in the field of foreign, security and defence policies. FIIA’s contribution builds on the previous work carried out in the institute on the report Multi-Speed Europe: Differentiated integration in the external relations of the EU (2014) and it will enable FIIA to strengthen its profile in this field of EU studies. Senior Research Fellow Ryhor Nizhnikau has written a book entitled EU Induced Institutional Change in Post-Soviet Space Promoting Reforms in Moldova and Ukraine (Routledge, 2018). 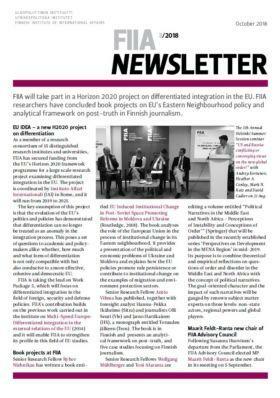 The book analyses the role of the European Union in the process of institutional change in its Eastern neighbourhood. It provides a presentation of the political and economic problems of Ukraine and Moldova and explains how the EU policies promote rule persistence or contribute to institutional change on the examples of migration and environment protection sectors. Senior Research Fellow Antto Vihma has published, together with foresight analyst Hannu-Pekka Ikäheimo (Sitra) and journalists Olli Seuri (Yle) and Jarno Hartikainen (HS), a monograph entitled Totuuden jälkeen (Teos). The book is in Finnish and presents an analytical framework on post-truth, and five case studies focusing on Finnish journalism. Senior Research Fellow Mikael Wigell and Programme Director Mika Aaltola together with Sören Scholvin (University of Hanover) have edited a book Geo-economics and Power Politics in the 21st Century: The Revival of Economic Statecraft (Routledge, 2018). Starting from the key concept of geo-economics, the book investigates the new power politics and argues that the changing structural features of the contemporary international system are recasting the strategic imperatives of foreign policy practice. Senior Research Fellows Wolfgang Mühlberger and Toni Alaranta are editing a volume entitled “Political Narratives in the Middle East and North Africa – Perceptions of Instability and Conceptions of Order” (Springer) that will be published in the recently established series “Perspectives on Development in the MENA Region” in mid-2019. Its purpose is to combine theoretical and empirical reflections on questions of order and disorder in the Middle East and North Africa with the concept of political narratives. The goal-oriented character and the impact of such narratives will be gauged by renowned subject matter experts on three levels: non-state actors, regional powers and global players. Following Susanna Huovinen’s departure from the Parliament, the FIIA Advisory Council elected MP Maarit Feldt-Ranta as the new chair in its meeting on 5 September. The Council’s duties include monitoring the Institute’s operations, societal impact and liaising with relevant FIIA stakeholders. The Council serves a four-year term of office, which commenced in June 2015. The composition of the FIIA Advisory Council can be found on the FIIA website. Agne Cepinskyte will join FIIA as a TAPIR Fellow at the beginning of October. She holds a PhD from King’s College London. Her research focuses on the protection of state and indigenous sovereignty in Norwegian and Russian Arctic Security Policy. Senior Research Fellow Mikael Wigell will spend October-November as Visiting Scholar at the Changing Character of War Centre of University of Oxford. The latest issue (3/2018) of Ulkopolitiikka (The Finnish Journal of Foreign Affairs) focuses on the issue of trust in international politics. The main article explains how and why trust amongst the EU member states has eroded – and what could be done to alleviate the situation. Ulkopolitiikka has interviewed European Ombudsman Emily O’Reilly, who discusses the challenges of her work. She strongly criticizes the Council of the European Union for the lack of transparency in its decision-making process. Meanwhile, the Committee for Public Information has granted a State Award for Public Information to Managing Editor Joonas Pörsti for his book Propagandan lumo. Ulkopolitiikka is available both as a printed journal and as an online version at www.ulkopolitiikka.fi which has undergone a complete facelift.